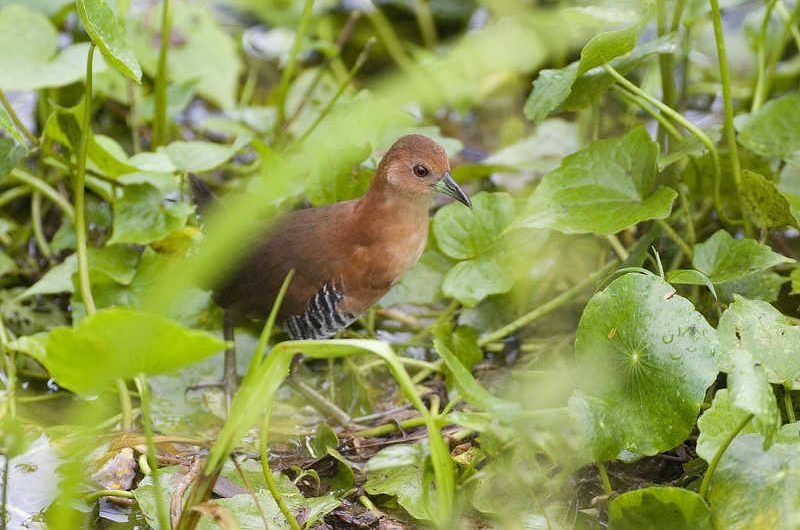 A small, elusive rail of the swamps, marshes and wetlands of Panama, the White-throated Crake, like many rails, is much more often heard than seen. It is a slender rail, 14-16 cm in length. It has a rufous brown head, neck, back and wings, and is especially rufous on the sides of its head, neck and breast. It has black and white barring on its flanks and undertail coverts. As the name suggests, its white throat is characteristic. Immature birds are duller above and have gray sides of head and breast. In Bocas del Toro (western Panama), the White-throated Crake has a grayish crown. It has red eyes, a short, greenish bill and greenish-gray legs. Sexes are alike, but males are slightly bigger and heavier than females. The White-throated Crake is the most common small rail in Panama; however, it is seldom seen due to its secretive nature. It hides in the tall grasses of marshes, wetlands and overgrown ditches, and is very difficult to flush. It can be easily detected by its call, a long, fast explosive trill that fades off at the end. It is very vocal and will respond to playback, but even if it does emerge from the grasses usually it gives just a glimpse. It is one of our guests’ most-wanted birds around the Canopy Family lodges due to its elusive behavior! White-throated Crakes feed on insects, spiders, grass seeds, algae and some fruits. They forage at water’s edge in wetlands, scouring grasses and calling frequently. Not much is known about their reproductive ecology, but they have been observed building a ball-shaped grassy nest with a side entrance. Eggs are creamy white with reddish-brown spots. White-throated Crakes are found in the lowlands and foothills to 1600 meters in elevation, ranging from southeastern Honduras to western Ecuador. In Panama, they are found along the entire Caribbean slope and along the Pacific slope in Chiriqui (far west) and from Coclé province eastward. Close cousins: The White-throated Crake is often considered to be conspecific with the Rufous-sided Crake (Laterallus melanophaius), but is possibly more closely related to the Gray-breasted Crake (Laterallus exilis), both of northern South America. There is still much to learn about these shy rails!